East Penn Manufacturing makes thousands of different sizes and types of lead-acid batteries and battery accessories for virtually any application. 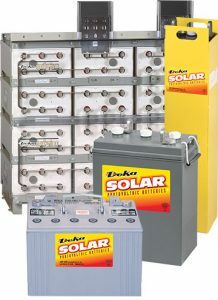 East Penn’s Deka batteries go through a series of over 250 stringent quality control checks and extensive testing to ensure the industry’s most accurate and dependable ratings. In addition, all Deka Unigy production facilities are certified to meet globally recognized ISO 9001 and TS16949 quality standards. All batteries shipped meet or exceed IEEE-485 and Telcordia capacity requirements. East Penn owns and operates the largest single site battery manufacturing facility in its industry. East Penn’s high tech facilities with computer monitoring and control systems are the most technologically advanced battery manufacturer in the industry. The East Penn manufacturing site includes a modern U.S. EPA permitted lead smelter, refinery and recycling center where virtually 100% of every used lead-acid battery returned to East Penn is recycled.